What is a Delicata Squash? This winter squash has a small seed cavity yielding lots of edible flesh. The skin is also edible if not too tough. Delicata will range in color from cream to yellow with green stripes. It’s moist and creamy with a sweet, buttered corn flavor. Puncture with a fork if cooking whole. Halve lengthwise and place cut side down in a cooking dish with 1/2 inch of water, cover and bake for 30-40 minutes at 375 degrees, or microwave halves in same amount of water covered for 7-10 minutes. Glaze with butter and brown sugar or top with chopped fresh herbs. Good source of vitamin C and low in calories. 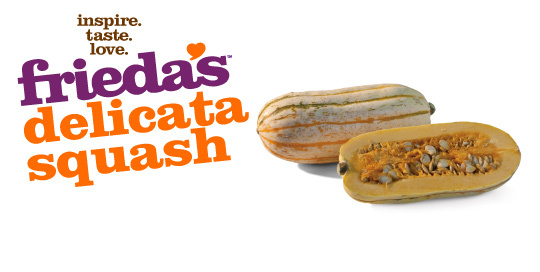 Choose squash with hard shells that seem heavy for their size.